The Canadian Christian Record Services (CRS) Inc., board has taken an action to transition the ministry of CRS and its blind camps to the local churches, supported by the local conferences across Canada. The distribution of materials to the blind in Canada, as well as the summer blind camps will continue without a significant interruption. 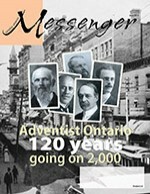 Details of a new community outreach, designed for the local church across Canada, will be unfolded in the near future.